Ok, so technically the girls are 16 months minus one day, but I am currently sitting in the airport waiting to board a flight to London, so wanted to make sure I got their update done before I left. 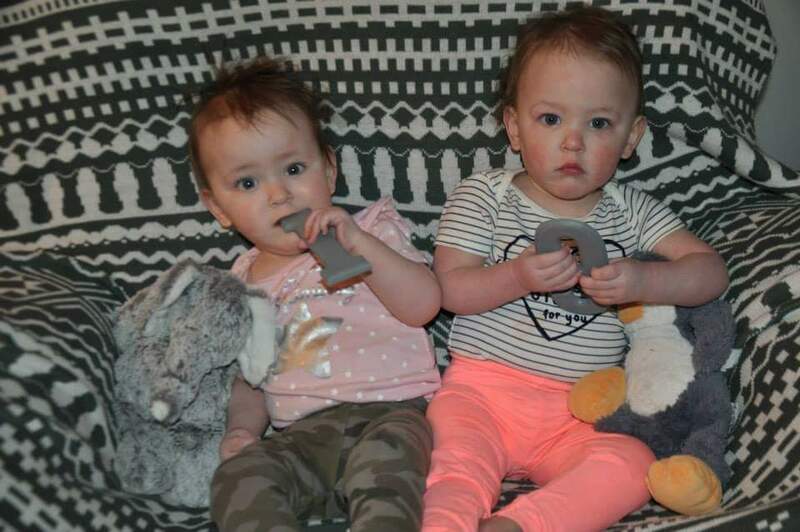 Misses Ella and Raegan are both 19 pounds, 30 inches. It’s actually hard to believe they’re the same exact size because Raegan looks like such a small fry. Raegan has 7 front teeth plus 4 molars and Ella has 6 front teeth plus 4 molars. We’re obviously some good teeth growers. Raegan is super close to walking. She can walk holding onto your hands and cruises everywhere. She’s her usual feisty self, and has now taken to picking up her plate while staring at you and turning it over so all her food falls off. It’s quite lovely. Raegan also has the sweetest little curls in her hair, which she mostly gets from twirling her hair before falling asleep. 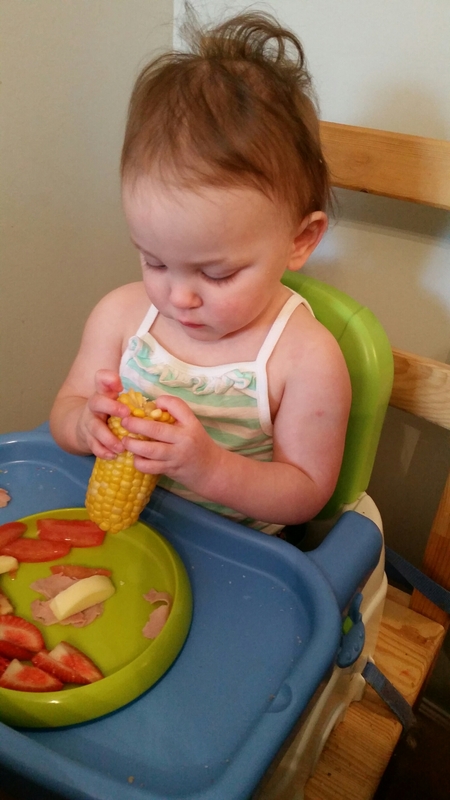 Raegan eating her first corn on the cob! Ella has started her Conductive Education class and had her second one today. She cried, but did so much better than last week, including sitting cross-legged with support and bearing weight on her legs while standing supported. She was quite tuckered out after from all her hard work! She also got to ride in our wagon for the first time with her adapted seat from Firefly. She was not a fan at first, but once I took her hat off, she loved it. 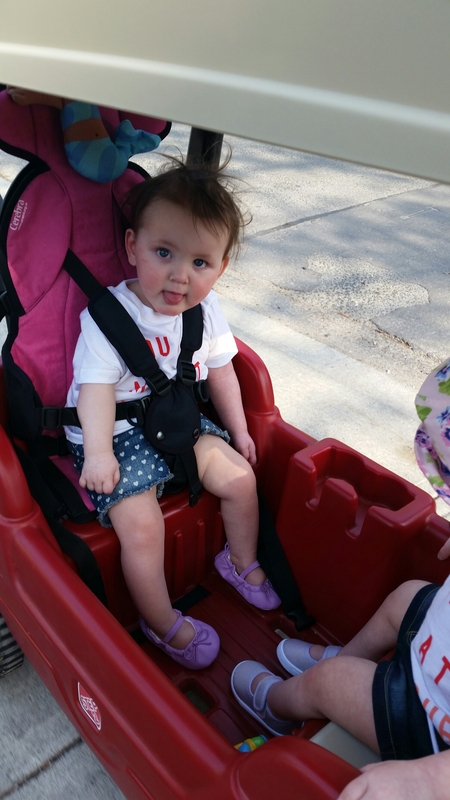 Ella riding in our wagon for the first time! It’s been hard transitioning the girls out of my full time care, probably as hard on me as them, if not more. I’m away for a week so hoping Ella has a better time this week not being so attached to Mama, while being super pumped to see me when I get back, of course. It’s so hard to believe another month has gone by, though not surprising with how busy we’ve been. This entry was posted in Baby love, Baby update! and tagged cerebral palsy, development, hydrocephalus, identical, milestones, momo, mono mono, NICU, preemies, special needs, toddler, twins. Bookmark the permalink.